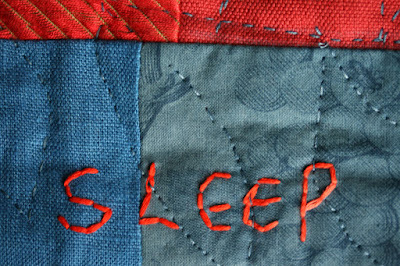 The exhibition 'Padainuok man labanakt / Sing me to sleep', opens on the 9th September at the National Gallery of Art in Vilnius, Lithuania, featuring our new quilt. It seems a good time to reflect a little on this art piece a collaboration with artist Lois Blackburn and visitors to homeless centres, The Booth Centre, Manchester and the Wellspring, Stockport. 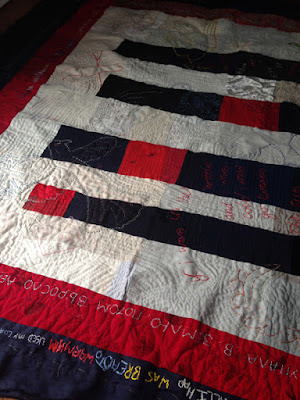 The Sing me to sleep quilt has many stories stitched into it. Like a friendship, it becomes deeper as you get closer. Seen from a distance it is a snapshot of a woodland. But come near and you'll see birds and flowers, even snowflakes. Closer still, you see that people are here, their words echoing the shapes of branches and dancing in air. And when you're near enough to touch, you can see the marks that people have made, individual stitches from quiet afternoons in homeless centers in Manchester and Stockport. A few hours of respite from chaotic lives. A safe place to dream, a fairytale. At some point in any of our lives we can lose our way in a dark and impenetrable emotional forest... we find if difficult to see the wood from the trees. The forest/wood is a recurring theme and backdrop in fairytales, steeped in ancient myth and legend. Little Red Riding Hood, Snow White, Hansel and Gretel lost in the woods, Beauty and the Beast... At the time these stories were first told, northern and western Europe was thick with woodland- (Lithuania still retains much forest.) The forest is a place of magic, it can feel dangerous, but is also a place of opportunity and transformation. It can offer refuge and protection. In the forest we flight the forces of darkness within ourselves, to emerge into the light. Woods and forests also have another layer of meaning to our participants, as a place to live, to escape the demands of everyday life. A number of the people we have worked with on this project have spent time living like hermits foraging in the woods for day to day survival. 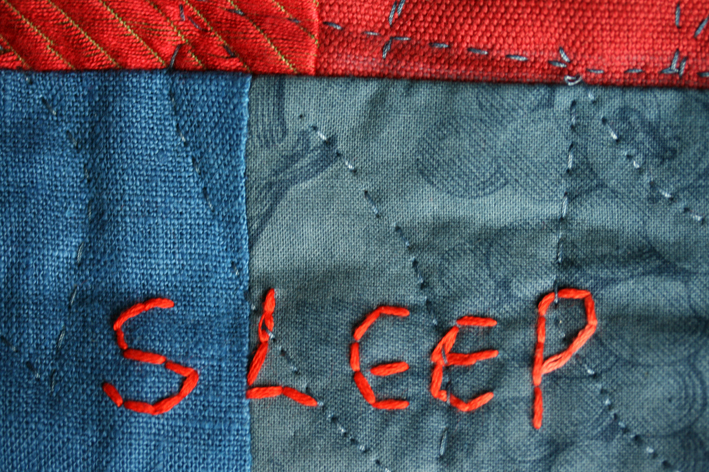 Birds are stitched into our quilt, they take flight then disappear in the trees. In fairytales because of their ability to fly, birds are often seen as messengers from the Divine. They also represent the ability to soar or rise above our problems. Think The Ugly Duckling, The Bluebird, The Golden Bird, The Seven Ravens. And stories that go back even further, perhaps the Greek story of Icarus. 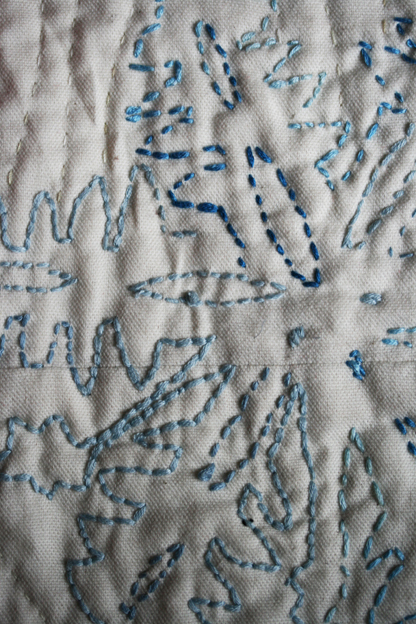 The quilt has a wintery feel, paper cut snowflakes (we joined in making them at the Homeless Centre in Vilnius) are stitched, childhood memories of The Snow Queen. 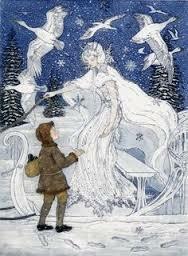 Arthur Rackham, The Snow Queen. The quilt design is inspired by the traditions of Welsh and Northumbrian 'wholecloth' making and Amish bar quilts. 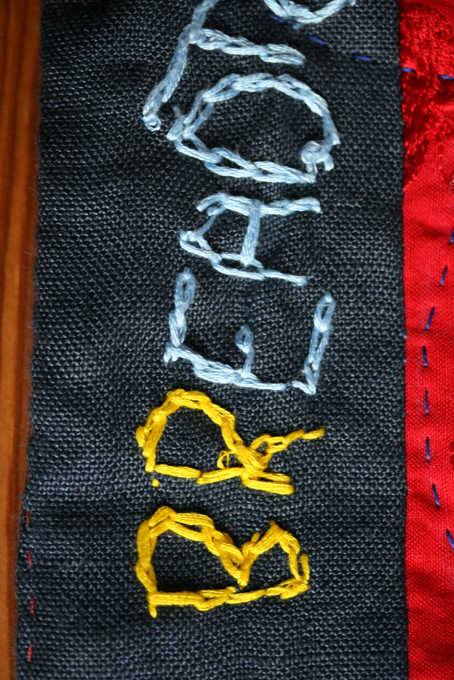 The stitching borrowed from the traditions Boro, Kantha and Sashiko embroidery. The colour pallet and atmosphere from remembered childhood illustrations from favourite illustrators Jan Pienkowski and Arthur Rackham. 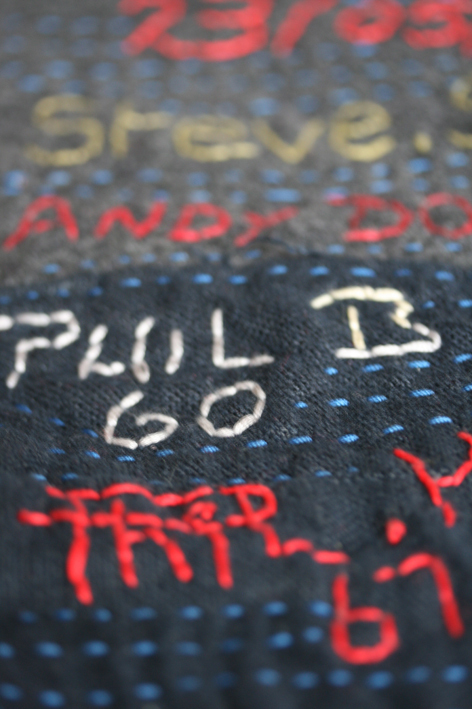 Stitched onto the quilt are some of the participants names, like names carved into wood, graffiti left for future generations. Stitched between the trees the are the words from Paddy: 'If I was in the woods and I was cold I would go towards the sun. icy crackling days, cold dark nights. yet unto my eyes he stared and to sleep I went. Thank you again for everyone who has given their time and energy to this project to make it possible. 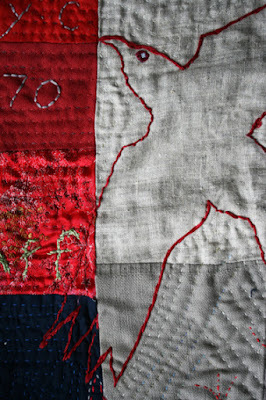 This project was supported by Arts Council England, The Booth Centre Manchester, The Wellspring Stockport, The National Gallery in Vilnius and Socialiniai Meno Projektai. I've never been on a plane before.